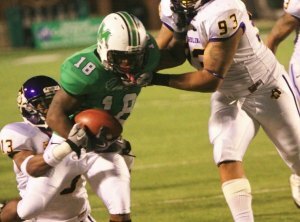 MIAMI -- Conference USA released 2013 football opponents for each of its members Wednesday, including the Marshall Thundering Herd, as the league’s Winter Meetings concluded. The Herd will host East Carolina, Southern Miss, UAB and UT-San Antonio and will travel to FAU, FIU, Middle Tennessee and defending C-USA champion Tulsa, during the 2013 football season. Marshall registered home victories over East Carolina, Southern Miss and UAB in 2011 and will face UTSA -- which like MTSU will be in its first year in C-USA -- for the first time. It also was decided that each C-USA member will play 16 league games in men’s basketball in 2013-14, with each of the 16 institutions playing one fellow member twice. For the Herd, that home-and-home foe will be Old Dominion University. The Herd will face MTSU in basketball after traveling to Middle Tennessee in March 2012 for a first NIT appearance in 24 years. While C-USA will have 16 basketball members in 2013-14, it will have 14 football-playing schools, with ODU (2014) and Charlotte (2015) starting league football play in future seasons. In football, Marshall is joined in the Eastern Division by East Carolina, FAU, FIU, Middle Tennessee, Southern Mississippi and UAB. The Western Division members are Louisiana Tech, North Texas, Rice, Tulane, Tulsa, UTEP and UTSA. The C-USA football and basketball schedules for 2013-14 will be stand alone for only that academic year. Future schedules have not been determined.